National Emblem – Mount Ararat together with Noah’s Arc and the emblem of four kingdoms of historical Armenia are illustrated in the center - on the shield: the Bagratunies are on the top left, the Arshakunies are on the top right, the Artashesians are on the bottom left, the Rubinyans are on the bottom right. The shield is supported by an eagle (on the left) and by a lion (on the right), and there is a sword, a branch, a sheaf of ears, a chain and a ribbon illustrated under the shield. The emblem colors symbolize the colors of the Armenian flag. Climate: Continental. In this small piece of land sultry summer and eternal winter exist almost side by side. The Republic of Armenia lies in the north eastern part of the Armenian plateau between the Caucasus and Asia Minor. In the north and east it borders upon the republics of Georgia and Azerbaijan, in the west and south upon Turkey and Iran. Armenia Border length: Iran - 35 km, Turkey - 268 km, Georgia - 164 km, Azerbaijan - 787 km. Ancient Armenia was one of the largest states of the Middle East. Its name is among six other countries depicted on a Babylonian map dating back to the 5th century B.C. Praesidial republic since 1991, constitution adopted in July 1995. 18 years is the threshold for the voting rights. One chamber parliament called National Assembly with 131 seats. Parliamentary election every 4 years. Direct presidential elections every 5 years. Armenia is comprised of 11 regions (marzes): Aragatsotn, Ararat, Armavir, Gegharkunik, Lori, Kotayk, Shirak, Syunik, Vayots Dzor, Tavush, Yerevan. Armenian. It is a separate branch of the Indo-European family of languages. Mesrop Mashtots created the Armenian alphabet in 405 A.D. In 301 A.D. Armenia adopted Christianity thus becoming the first country in the world to proclaim it a state religion. The Armenian Church is one of the Eastern Orthodox Churches. Holy Echmiadzin is the historical center of Armenian Apostolic Church, the seat of the Catholicos of all Armenians. 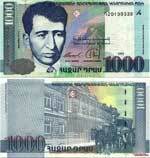 The dram/AMD/ is the monetary unit of Armenia. It is subdivided into 100 luma. The word "dram" translates into English as "money", and is cognate with the Greek drachma. 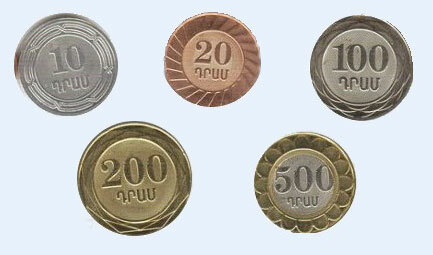 The Central Bank of Armenia has the exclusive right of issuing the national currency according to Armenian Law. The dram came into effect on 22 November 1993. 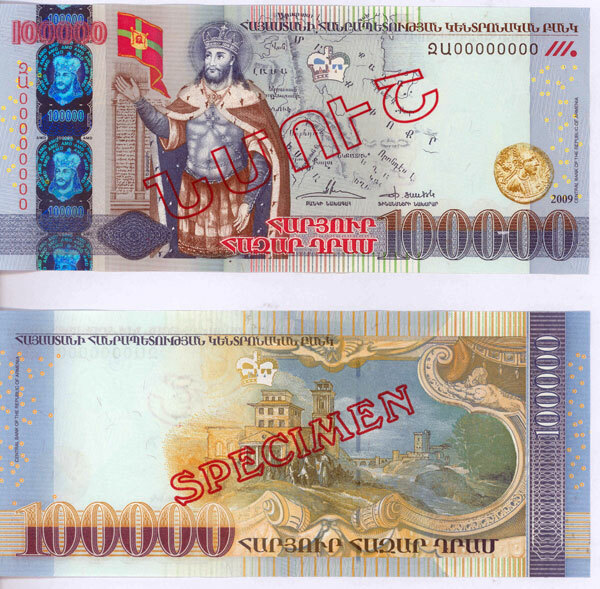 Banknotes currently in circulation – 1000, 5000, 10 000, 20 000, 50 000, 100 000 dram. For the import and export from the country of the foreign currency there is no limits, only the customs declaration must be filled out (it must be saved until the departure). The amount more than 10 000 dollars USD (or equal in other currency) must be transferred through the bank. 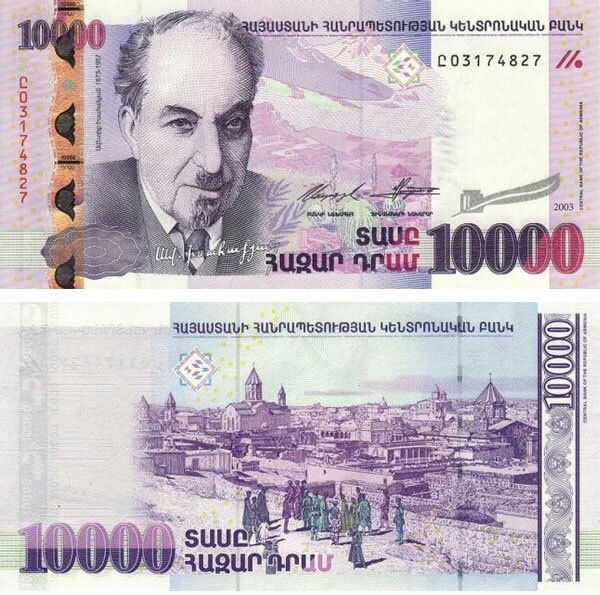 Import and export of the native (local) currency is forbid. It is allowed to import the things of personal use, and goods and other things with the total cost equal to the no more than 500 dollars USD without custom payments. The import of the alcoholic drinks - up to 2 liters and also tobacco goods - up to 50 packs without customs duty is allowed. For all imported goods and things, which total amount is more than the mentioned above, must be paid the custom duty. Import and export of all kind of antic goods, including the jewels, coins, manuscripts and other art works, without allowance of the correspondent departments is forbid. The transit of the narcotic, poison and explosive substances, arms and ammunitions (excluding hunter’s arms, which must have permission of MIA RA) is forbid. Bus: N201 from airport to the center of Yerevan (Opera House) runs 7:30am-6:00pm every 20minutes, fare is 150 AMD (around 0,50 $). Minibus: N107 from airport goes to Barekamutyun Metro (also know as Druzhba) and N108 goes to the railway station. Both run every 20min from 8:00am to 8:00pm; fare is 200 AMD (around 0,65 US$). Taxi: From airport to the centre is fare 5000 AMD (around 16 $), from centre to the airport is fare 3500 AMD (around 12 $). No risk for health. No need for vaccination. The government offices and NGOs work every day, from 9:00 a.m. till 18:00 p.m., except for Saturdays and Sundays. Important note: Before departure from Armenia have to be paid state Exit Duty in the amount 10000 AMD.